Bhagavad Gita and wealth creation are still perceived as odd combinations. In Hinduism if you want to take the spiritual path, the first advice is ‘give away all your money and wealth and head towards the Himalayas.’ Who needs money in a Himalayan Cave? But to be spiritually oriented and to live in a society we need money and we need to generate wealth. Generating wealth through hard work is not a sin. To live better money is as essential as water. Bhagavad Gita helps us in striking a balance it shows us how to create wealth. To create wealth the brain has to be challenged every moment. We have to make use of it for family, society, market and in business deals. In simple sense we need to do Karmas and face realities of life. In Bhagavad Gita, Arjuna when faced with the realities of life wanted to take refuge in meditation and spirituality. Krishna scoffed at that Arjuna who could not face reality. Real spirituality is the one which is practiced in society and not in Himalayan caves. Look at the profile of the successful entrepreneurs in independent India, majority of them faced the reality and addressed the challenges boldly. They did not take refuge in caves or in fate. Today spirituality is like spending time in satsangs, visiting temples, donating money in the hope that the Lord will automatically make one a multibillionaire. Everyone has their own method towards spirituality. But according to me it is better to realize that god is residing in us, so we should realize our hidden potential and put it in action. Arjuna was finally ready for action once he realized the Krishna was in him. When we stop searching for God outside of ourselves and realize he is us and we are him and we take action with this knowledge, certainly wealth and success is sure to follow. When the spiritual strengths are realized inside, this will overcome the physical and intellectual strengths that we may be lacking. This is what “The Secret” is all about. It is not a new concept, just an old concept with a nice new package. Many of us do not like to work, and are forced to do so in order to make financial commitments. If we learn to enjoy a type of work, we automatically start to excel in it, and then the wealth and success follows. Quite often instead of enjoying the work, we worry more about what we will get from it. Instead of concentrating on the cleaning of the table, the waiter is more bothered about the tip the guest will offer, the programmer is thinking about bug or end results and player is thinking about endorsement. Net result is that we do the job badly, we don’t enjoy the work or the moment and ultimately all the monetary dreams are shattered. Work done with selfish motives is inferior by far to the selfless service or Karma-yoga. Therefore be a Karma-yogi, O Arjuna. Those who seek (to enjoy) the fruits of their work are verily unhappy (because one has no control over the results). Our selfishness is always thinking about the end product and to create wealth without hard work. Put heart and soul in whatever you do because it is more worthwhile than chanting mantras. When you work wholeheartedly, you are indulging in creation and it touches the spirit in you and you experience spirituality. Wealth, success and fame will automatically follow. But what if I fail? This is lack of self confidence. This comes out of unnecessarily thinking about the fruits of your work. Rarely does one achieve success in first attempt. Each failure teaches us several lessons. Each failure takes us close to success. Every work creates a result, so work without getting attached to results. A Karma-yogi gets freedom from both vice and virtue in this life itself. Therefore, strive for Karma-yoga. Working to the best of one’s abilities without getting attached to the fruits of work is called (Nishkaama) Karma-yoga. When we succeed we are happy, when we fail we are sad. But what was our state of mind when we were working. Gita is more interested in the state of mind when you were working. 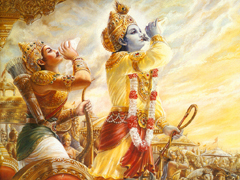 Krishna asks Arjuna to enjoy the moment and do the work efficiently. Arjuna should think about the first arrow that he will aim at Bhishma not about the last arrow striking Bhishma. Similarly, each moment you have to stand up to challenges, take risks and by enjoying each moment, you slowly move towards the victory. Person in steady mind in work Bhagavad Gita calls such a person ‘Sthiraprajna’ – a person of steady wisdom and self knowledge and who cannot be shaken. To create wealth and to enjoy it, you need to be a ‘Shiraprajna’ and then you will realize that your very nature is happiness. I do accept that understanding every aspect of “Srimad Bhagvad Gita” is very difficult but you need to find out your own method to understand. Simplest way which I have for you is just observe front photo of Bhagvad Gita which shows that “Rath of Arjun is drive by Lord Krishna that Rath has Four Horse dharm, artha ,kaam & moksha. Similar to this Lord Krishna is also driving our Rath of Life containing these horses if we spoil any of karma towards it (dharm,artha,kaam & moksha) Lord Krishna beat this horse/us by whip to redirect us correct way. You can share your own understanding by adding comment. If you have yet not read Bhagvad Gita, I hereby request you to pick up the “Srimad Bhagavad Gita” and read it and I am sure you will find answer of all your problems. After reading you will be full of wonderful ideas and thoughts.